The Double Chamber Vacuum Packaging Machine You Can Trust! Whether it's meat, poultry, cheese, fish, seafood, or produce that you need to preserve, the Ultravac 2100 dual chamber vacuum packaging machine is the most dependable, simple to own, simple to operate in the marketplace. 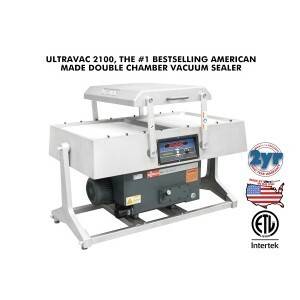 The Ultravac 2100 is available in two different sizes, 8” or 12” chamber depths, and several pump and chamber configurations to meet your specific production needs. All machines are equipped with air cooled rugged vacuum pumps. The 8” model is available with a 7.5, 10, or 12-hp pump. For larger sized products like hams, turkeys, large primal cuts, or cheese blocks, the 12” chamber depth is recommended and comes equipped with a 10-hp or 12-hp pump.